There were quite a few of these delicately coloured mushrooms between the path and the ditch. I've seen quite a few of last year's frogs, but they normally hide very quickly. This one was a little slower than most. Frog length was about 2" from nose to toe. The Angelica flower head was clearly attractive to these wasps. I managed to get the close-up on the right without getting stung. At this time of year, parts of the Herb Robert often turn bright red. This Parliament of Rooks appears to be debating the fate of the one at the bottom of the picture. This is another view of the Common Darter - this time from the rear. Two fungi to start, today. The one on the left was growing over an area of 2 sq. ft. It can be seen at the top and bottom of the picture. The Helvella corium on the right is about 1" long. This is the leaf rosette of the Butterwort. The leaves are very sticky in order to catch insects. This Grasshopper was sitting on a young Willow. This is the Upright Hedge-Parsley. The leaves are very small and delicate, as is the whole plant. This spider was making a meal of a hoverfly larger than itself. This is another parasitic wasp - probably an Ichneumon. With the very large yellow antennae and the long yellow legs, it looked like a large yellow X flying through the air. These flower buds of the Ivy will eventually be replaced by black berries. The flowers of the Valerian are arranged in loose umbrellas. Yesterday we had the most violent electrical storm - surrounded by lightning for over an hour. Today, I got some better pictures of things shown earlier in the year. 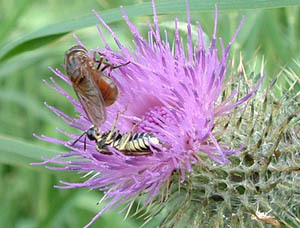 On the left, the wasp with the white strips in its antennae. On the right, the Yarrow. Compare the Yarrow with the Sneezewort from July 26th - they are closely related. At this time of year, the Fuchsia turn the whole hedgerow red. Finally, today, the seedheads of the Square-Stalked St. John's Wort. 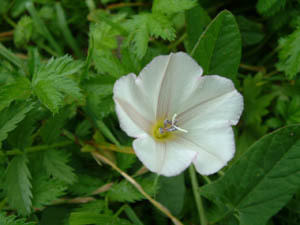 This is another Bindweed. Much smaller than the others, the Field Bindweed flowers are only 1" across. On Tuesday, I found the cross between Square-stalked St. Johns Wort and Perforate St. Johns Wort. I went back today to photograph it but the deadly strimmer had flattened everything. Fortunately, I spotted this lovely yellow mushroom on a white stalk. It's about 2" high, so very fast growing. An interesting image to start off, today. 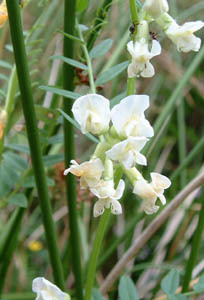 This is a white form of the Bush Vetch: It is at least 3 months behind the usual purple form. This Ichneumon fly was feeding on the Angelica. 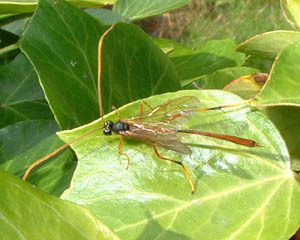 The long 'spike' from its tail is the ovipositor, or egglaying tube. This wasp was another feeding on the Angelica. If I want to take insect pictures, all I have to do is find an Angelica plant. And here we have the first ripe Bramble. 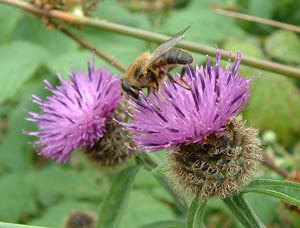 This is where baby hoverflies come from - Thistles. This is the seedhead of the Smooth Hawks Beard. There is an old railway building just outside town. This plum tree is still growing to the side of it. The Corn Sow-Thistle can get very tall, indeed. This flower head is about 2" across, but I've seen larger. This is the seedhead of the Hogweed. And these are the seedheads of the Nipplewort. This is the Marsh Woundwort and a close up of its flowers. These seeds of the Meadowsweet have deep curly grooves. This yellow Boletus mushroom grows under Scots Pines. It's about 3" across. 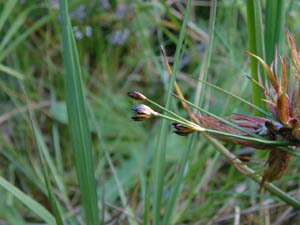 The following photos show a Jointed Rush that has been infected by a louse, forming a gall. 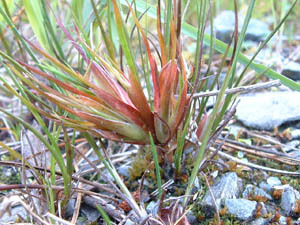 The offending creature is Livia juncorum, and is known to affect Jointed and Bulbous rushes. This is the seedhead of the Marsh Thistle - the darkest of the thistles on the patch. And this is a better picture of the Pale Persicaria than the earlier one. Currently, large swathes of disturbed land are one continuous band of pink. I do like these hanging spiders. This spider's web is built in front of the Convolvulus leaves. This gall was very obvious under the Willow leaf: It appears to be made by Pontania viminalis, a Sawfly. Sadly, the seedheads are all that is left of the Spotted Orchids. This year there were many more than usual, and the heads were taller, too. This is the next stage in the dung-loving fungus I showed 2 weeks ago. 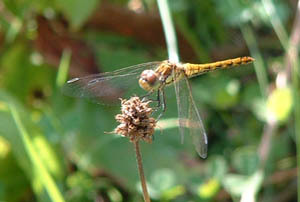 This Darter perched briefly on the Ribwort seedhead. This Hawkbit is yet another yellow daisy. Rain, today (and plenty of it). I managed to get this picture of another Rush before we had to call it a day. These Rust spots were prominent on the Coltsfoot leaf, both from above and below. I've seen brown, red, yellow, green, cream and orange Frog-hoppers, but never a metallic blue one. These tiny flat red fungi were about 7 mm across. These are this year's Scots Pine cones. I was a bit surprised to find this fruiting cone of the Mares Tail at this time of year. These are the seedpods of the Greater Willowherb - a typical Willowherb shape - long thin and rectangular. The Lady's Mantle is making a second push. It was raining as we walked, today, and I love the way the water sits on the leaves. Now I know that Autumn's just round the corner. These are the immature berries of the Elder. Notice the hooks on the end of the Lesser Burdock seedhead's spikes - handy for catching onto passers-by. Had to go on a long car journey, today, but took the camera for the Annexe. Lots of interesting stuff. By the way, this is the gall of the Speedwell Gall Fly, Jaapiella veronicae. It makes a gall in the tips of Germander Speedwell shoots. A couple of new plants, today. On the left, the Marsh Cudweed, a small plant that often grows on rutted tracks, and on the right, another escape, Golden Rod. Someone's going to get lucky - 2 four-leafed clovers on one plant. 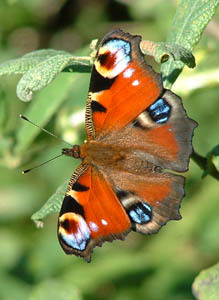 The Peacock just has to be one of my favourite butterflies. This is a particularly clean example. Two pictures of fern spores to start: On the left the Hard Fern, and on the right, the Hartstongue. This is yet another parasitic wasp. At first I thought it was a Crane-fly, but the close-up revealed all. Notice the Rust on the Bramble leaf, too. And these are the seedheads of the Ragwort. Most Ragwort plants were ravaged by the caterpillars of the Cinnabar Moth this year. Many insects appear to like being on Nettle leaves. Maybe it's some sort of protection, but I see many spiders on or near nettles, so they are obviously aware of the rich pickings. In this shot, the seeds of the Marsh Woundwort can plainly be seen. The seeds of some of the Docks turn a bright red. And here's another unseasonal Mare's Tail cone. This time it's on the Water Mare's Tail. It appears that we're having some kind of second spring, this year. Many plants are taking the opportunity for a second seed/spore production. This bright orange mushroom was growing in the green part at the centre of the path. It's about 2 cm across. Here's another slug - a brown one, this time - about 15 cm long. 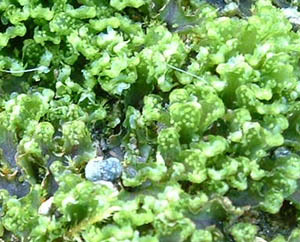 This Liverwort grows on damp paths - it has spores, as you can see. The spore bearing structures are about 3mm high. This yellow Thorn moth closely resembled a dead leaf. This Hard Fern tends to grow at the back of the ditch and remains well-hidden. I thought these bird's feet prints looked interesting in the mud. Note the pecking holes near the base of the plants. This red Sorrel leaf caught my eye next to the Selfheal seedhead. This lichen makes interesting patterns on the rock. A fascinating caterpillar on the Willow leaf. These are the seed heads of the Slender St. John's Wort. A couple of fungi. The one on the left was about 15 cm across. The orange one was about 1 cm. This is another image of the Autumn Hawkbit., but with a difference. The plant is normally 12 to 15" tall. This one was dwarfed, and was only 1" high. And lastly for today - the seedhead of the Angelica. My insect trap is gone for another year. The Common Fumitory tends to grow on newly turned over soil. This appeared where a verge had been dug over. These are the female and male flowers of the Alder - a tree that is remarkably similar to the Hazel. That's August over. Again, a very productive month. Let's see what September has to offer.